The waistband was the next step on my test garment, and it’s been the most fun part of making this skirt so far. “Fun” may seem like a goofy way to describe a sewing step, but it’s been the most sewerly (so-er-lee, not sue-er-lee) step thus far. I stitched in the ditch! I finally understand what that means! A bit of extra width. The directions (above) are a breeze to follow. 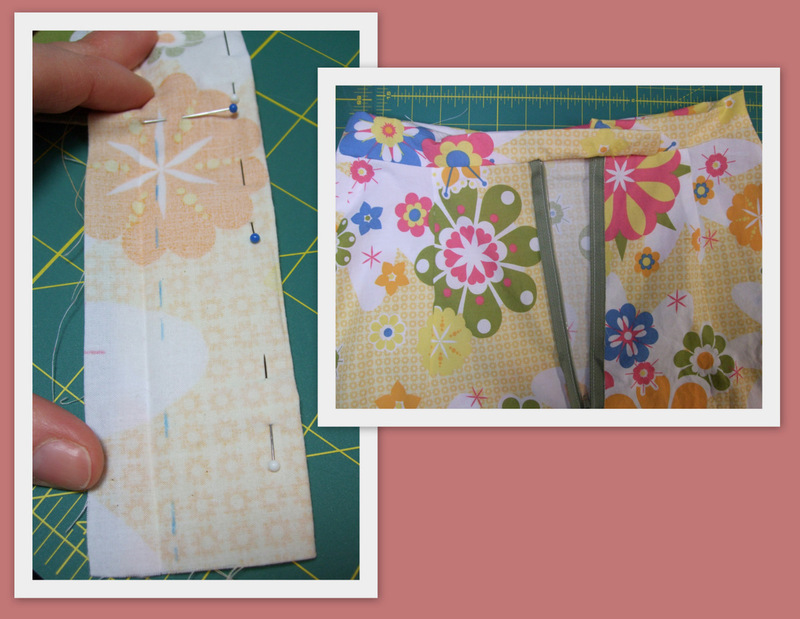 First, the waistband is folded the long way, with one side a quarter inch wider than the other (see above photo). I pressed the waistband at this point, because I like sharp creases. I don’t think it’s something you havta do. But, as we’ve covered before, I’m a smidge paranoid. A smidgen, even. Folding up the longer side. 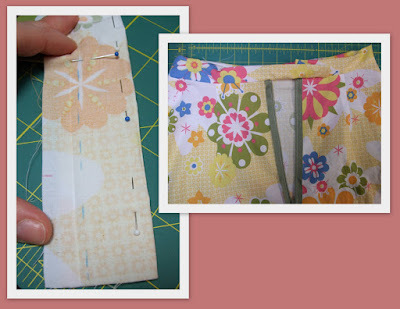 Then, along the wider side, I folded the edge under half an inch (see above photo). Then I pressed that edge and took a photo of myself doing it. This was probably a bad idea, but it made for a cool and steamy picture, plus it’s a photo of a person and not just fabric, a sewing machine, or a duct-tape likeness of an Erin-sized woman. I’m thinking about YOUR needs, readers. Also: I may own the world’s hottest iron. It’s a Rowenta, and it’s a super-duty piece of equipment. It was expensive, and I think it will be the last iron I ever buy. Sometimes I use bursts of steam from the iron to kill spiders. From here I sewed the unfolded edge of the waistband to the skirt using a half-inch seam allowance. Notice how I arranged the pins in the above-left photo so they would be easy to remove — a good example of thinking ahead! The untabbed end of the waistband. 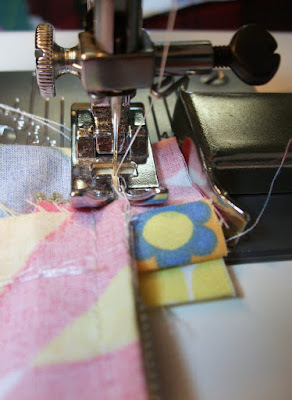 At the end of the waistband that will not overlap (i.e., the end that will be flush with the zipper), I sewed along the half-inch seam allowance (see above photo). The idea is that the seam is even with the zipper. 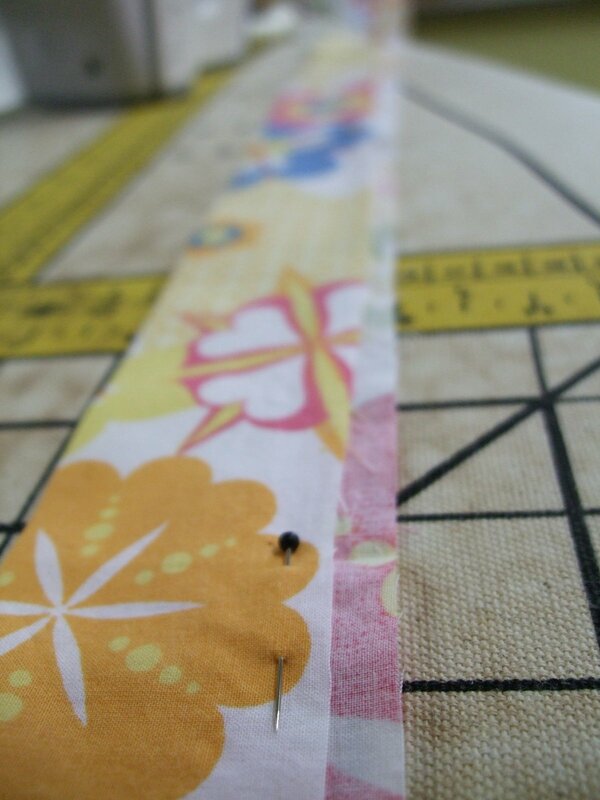 The tabbed (or buttonhole) end of the waistband took a bit of planning. 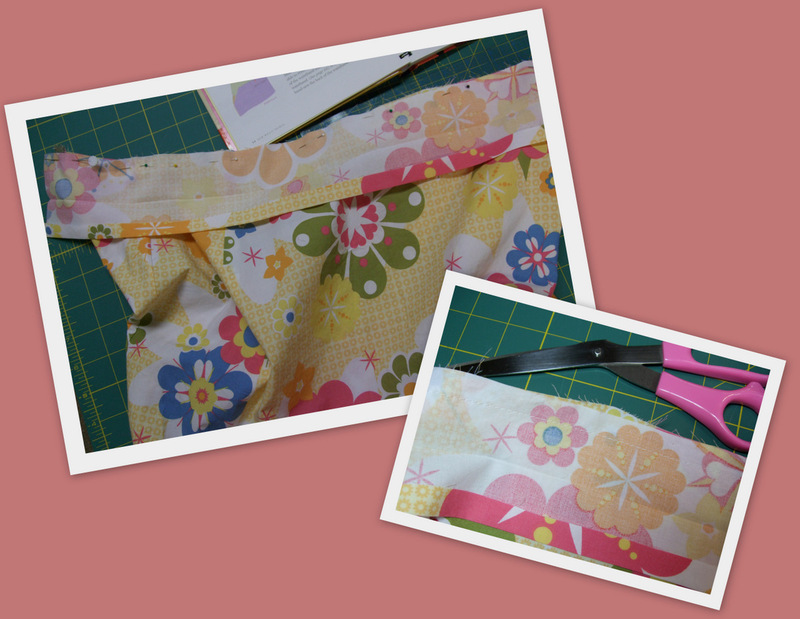 I drew sewing lines, which happened to run underneath the folded edge, before I sewed the waistband to the skirt. 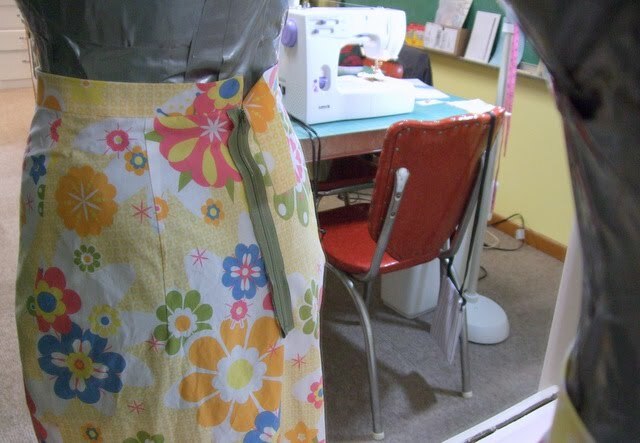 After sewing the waistband in place, the waistband and seam allowance were pressed up and away from the skirt. This is where the sewing lines became useful. It’s hard to explain this step; it’s one of those things you need in your hands to understand (or maybe you’re sharper than I and you get it right away; if so, we should hang out, smartypants). The idea is to finish the tube that will become the buttonhole end of the waistband. 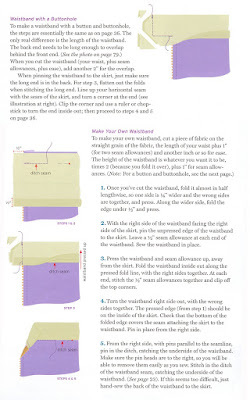 It involves sewing off the skirt, which is why the sewing line is very important. 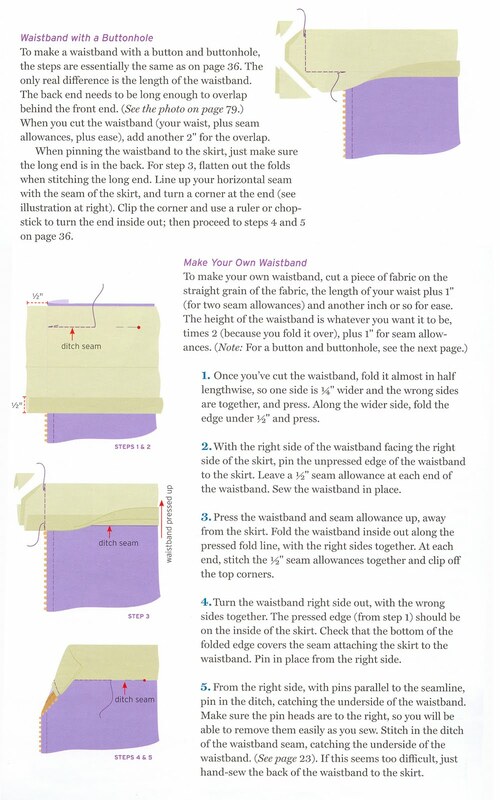 Essentially, the seam line between the waistband and the skirt (the sewing line a half inch from the top of the skirt) is continued on the tabbed end of the skirt. Once I got within half an inch of the edge of the tab, I turned the corner and sewed off the edge. It’s easy; I’m making it sound harder than it is. 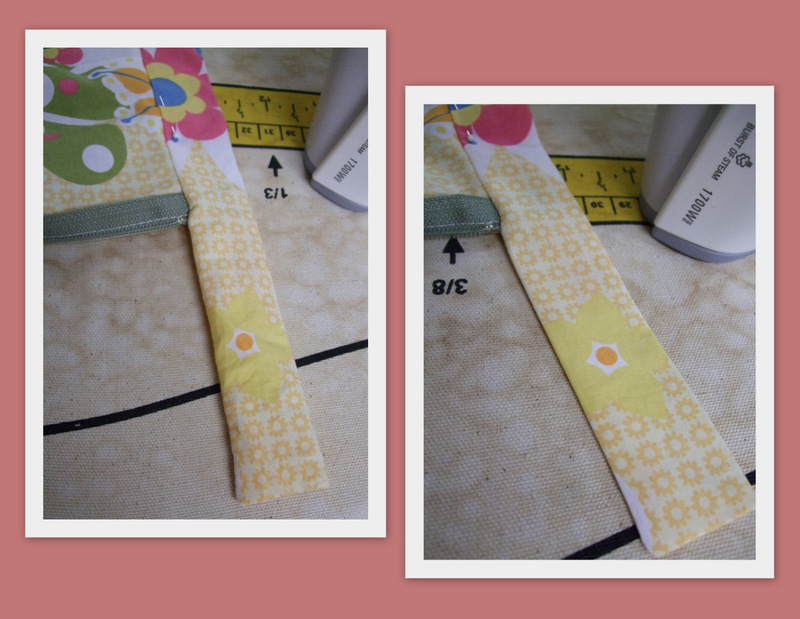 Finally (but not really finally), the corners of the ends are clipped, and the waistband is turned right-side out. When I read this part of the directions (it’s step 3 in the image at the top of this post, FYI), it didn’t make sense, but what I needed to do became very obvious in the moment. 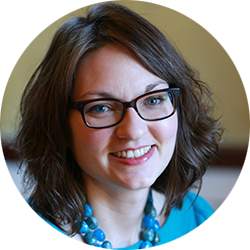 I am a visual, hands-on learner. After the waistband was turned right-side out and looked pretty like a waistband should, save not being stitched to the skirt, I pressed the whole business again. Press, press, press. 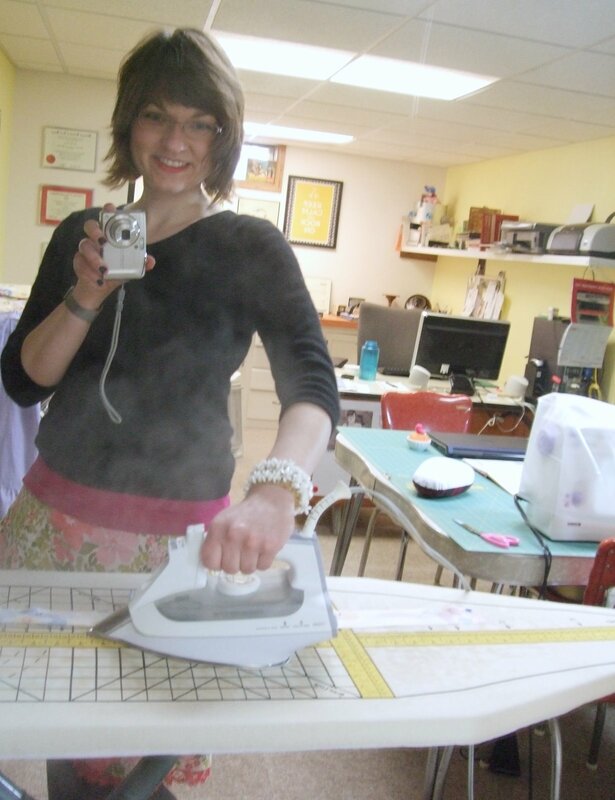 Yeah, a sewist probably could overpress a project, but sheets are forgiving and like it a little rough. 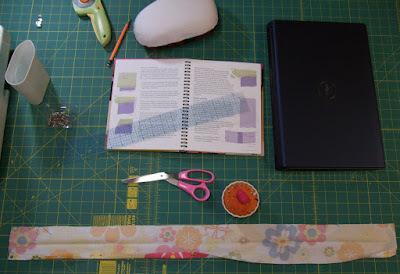 Next: stitching in the ditch! Stitching in the ditch is so clever. The finished waistband, sans the button and buttonhole. After I stitched in the ditch, I pressed again to lock in the stitching. I hope you stayed with me for this epic post! If you did, you rule. If you didn’t, well, you probably still rule because you had the good sense and heart to stop by Sie macht. My thanks to all. 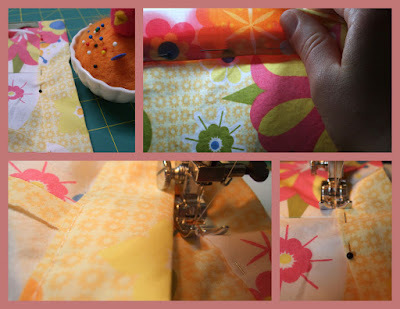 I love following your sewing adventure. I can't wait to see the finished project!